After snowing all morning, it was a balmy 35 degrees. 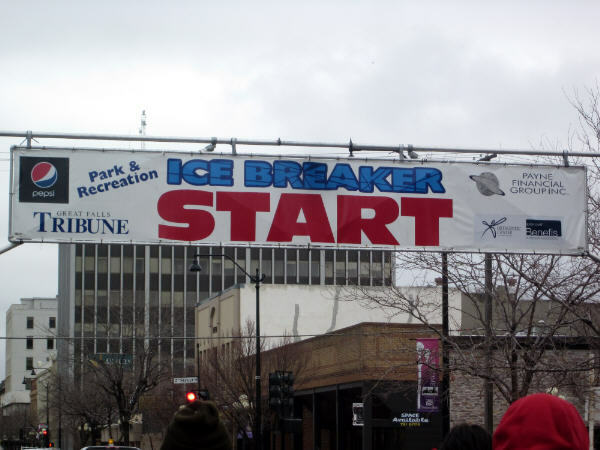 Today was the 32nd Annual Ice Breaker Road Race. Of course, this being our first spring here, it was our 1st. 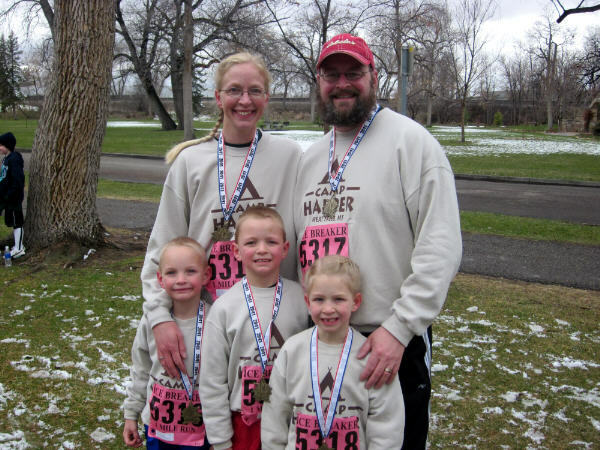 There were three separate races, the 5-mile, 3-mile and the 1-mile. I signed us up for the 1-mile so we would all be able to run it together. Playing before the start of the race. William was ready to go, so once the starter gun went off, he was gone. Rob shot me a look of guess-I-better-stay-with-this-crazy-kid, and off he went to follow him. I stayed with the twins and we had a great run. They both ran the whole mile. I was so incredibly proud of them. You can see Rob under the H with his hands up, they had just announced our names. 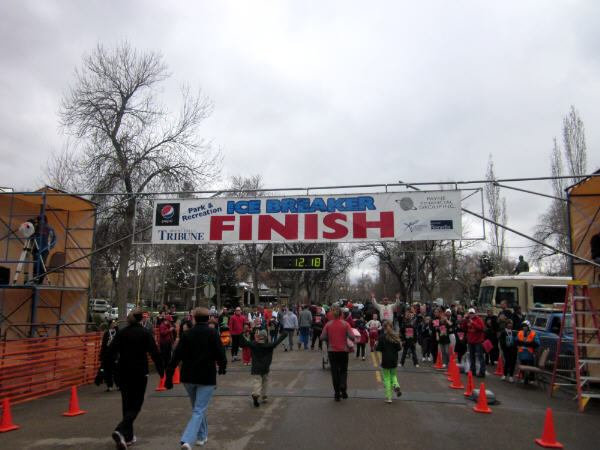 As we crossed the finish line, the announcer called out our names, which was pretty cool. I could see Rob and William waiting for us not too far ahead. The twins and I ran the mile in 12 minutes, not bad at all considering I wasn’t sure if they were going to be able to run the whole thing. Rob and William finished in 8 minutes. Pretty impressive. We finished with a medal and a sack lunch. The atmosphere was so energized and we all had a great time. 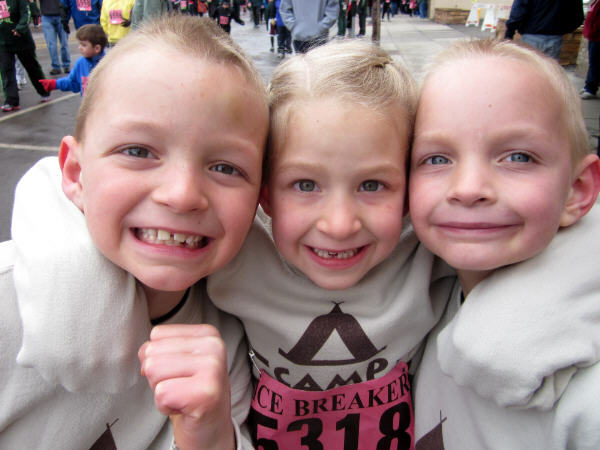 The kids are already talking about running the 3-mile next year. Sounds good to me. This entry was posted in Crazy Kids, Daily Life, Family Adventures and tagged Ice Breaker, postaday2011. Bookmark the permalink. Way to go Harper 5! I like your matching jerseys too! Are you ready for Bloomsday? Aren’t our sweatshirts great? Thank you for them. 🙂 Hopefully we are ready for Bloomsday. I guess we will find out in two weeks! Oh my goodness, it is coming up fast! I see the remains of the snow on the ground! But, it sounds and looked like you all had a good day anyway. I’m proud of all of you for running your first fun run together. First of many more to come. Good luck at Bloomsday! The last fun run we did the twins were in a jogging stroller! There are definitely more in our future!